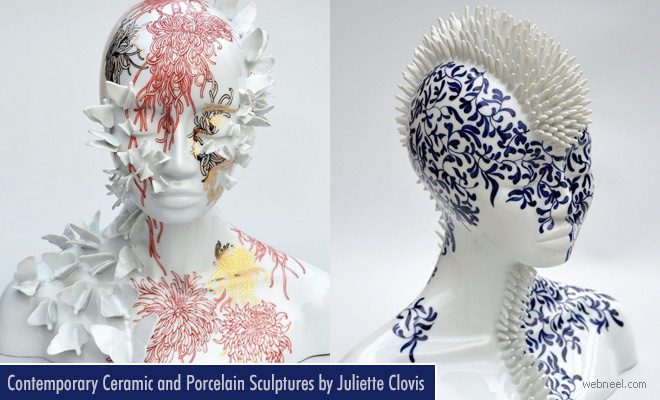 Porcelain Sculptures: Juliette Clovis is a French multidisciplinary sculptor. Her porcelain sculptures are always about woman and their strong empowerment on the society. According to her biography,"Fascinated by the wild beauty of Nature discovered during her different trips, the artist draws inspiration from it to create her human jungles and to explore the wild aspect of human body. Conjugating ambiguity and employing metaphors, Juliette’s work wobbles between a prophetic picture announcing the birth of a new living being, human body with a half-animal half-vegetable face; and the onset of death caused by an hungry nature wanting to take back its rights.All her sculptures are unique, made by the artist’s hand, in the traditional way of Limoges porcelain. Limoges porcelain is a fine translucent porcelain equivalent of Sèvres, Meissen or Nymphenburg. And for the sculptures with painting, they are also all made by the artist with traditional on-glaze paintings. All her porcelains sculptures are mixes between contemporary expressions and classical forms, dialogue between history and modernity." She has more than 10 years experience in this field and you can always find her armed with little cutters and glue to fix her vinyl flowers or butterflies.